Similar to equipment connectivity, a good visual management program should easily synchronize data with existing networks and servers. This synchronization enables the displaying of target KPIs and allows the manufacturer to pull all its collected metrics into common data analysis tools. TO IMPROVE PROCESSES, DRIVE PRODUCTIVITY and maintain a competitive edge in today′s global economy, leading companies use key performance indicators (KPIs) to measure their effectiveness in achieving business objectives using advanced management tools and analytics. Using visual management tools to illuminate these metrics in real-time offers unique insights that empower organizations to resolve operational inefficiencies in the moment, as they are happening. In particular, companies are able to re-engineer and streamline operational processes to maximize profitability. This article reviews common KPI measures, and explores options for sharing results using visual management techniques to help drive optimal productivity within organizations. It also outlines the key elements of an effective visual management system. A major obstacle in the development of IoT solutions is the ability to make data actionable. Manufacturers often have a sense that there are inefficiencies on the plant floor, but find difficulty identifying them. They are correct; inefficient processes and waste happen every day in every plant around the world. In fact, the "hidden factory" phenomenon indicates losses due to workarounds, rework and inefficient changeover procedures can be as much as 40 percent of total company effort. The strategic principles and practices of lean manufacturing used by many organizations help improve inefficient processes to drive productivity and rise above the competition. A variety of lean philosophies exist, such as Kaizen, Six Sigma, total quality management and continuous improvement. Despite varying concepts, each practice uses KPIs to analyze and optimize manufacturing processes. KPIs are top-level metrics that measure the use of facilities, time, material and personnel for manufacturing and process operations. KPIs set expectations and show gaps between actual and ideal performance targets at both the plant floor level and the organizational level. They can also measure the positive or negative effect of deviation from the norm and communicate success or failure of processes. To make this data actionable, KPIs must be communicated in an understandable and meaningful way to production floor personnel and their supervisors—ideally in real-time. Measuring and displaying KPIs in the work environment produces immediate gains in operator performance. The performance improvement links to employee awareness, pride and competitiveness. Integrating a KPI tracking program with visual management tools has the power to shift individual and organizational behaviors. With accurate, real-time visibility into production processes and inefficiencies, manufacturers can transition from the dreaded "do more with less" mentality to a more positive "do the right thing with the right amount" outlook. Delivery targets: Production slowed by inefficiencies can compromise the ability to deliver on tight customer deadlines. Market demand changes: Operational inefficiencies make manufacturers slow to respond to ever-changing market demands. Unforeseen event response: Unscheduled downtime or other unforeseen events can bring production to a halt for hours or even days, resulting in significant revenue losses. New product introduction (NPI) cycle time: Lengthy ramp-up times limit the ability to introduce a new product to market ahead of competitors. Human resources: Misallocated labor resources and unmotivated employees put a strain on productivity and performance levels. Waste: Production line inefficiencies result in increased scrap product. The clues to unlocking inefficiencies are in data. Machinery on the plant floor has the potential to deliver meaningful information. But it is up to the organization to capture that data and find the value in it. Additionally, companies don′t always look at the bigger picture of KPIs. They may be recording the data, but without careful analysis, they miss out on seeing longer-term trends and responding with data-driven decisions. Visual management tools connect to production equipment and collect the output data, which is then reported on a display, usually a large TV screen. To close the gap between data collection and action, organizations should track metrics in real-time and report them via visual management systems. By capturing, tracking and displaying KPIs with visual management techniques, an organization can flag abnormalities on the production line and initiate immediate, responsive action. The insight provided by the displayed data gives employees at all levels a better understanding of company goals and how individual performance contributes to the success of those goals. Line of sight to metrics increases employee accountability and ownership. It also invokes a natural sense of competitiveness among individuals and groups within the organization. Implementing this transparent, performance-based culture can increase productivity. KPIs will vary by organization, but certain metrics are routinely used in production environments around the world. Eight common KPIs include the following. An essential factory floor metric is the amount of product produced. The count, good or bad, typically refers to either the amount of product produced since the last machine changeover or the sum of the production for the entire shift or week. By integrating visual management displays, companies can compare individual worker and shift output. While management can use this information to evaluate performance, displaying it also tends to create a competitive spirit among employees to perform better than their peers. Many organizations display target values for metrics, such as output, rate and quality. These target KPIs can track the performance of each employee, production line and shift. 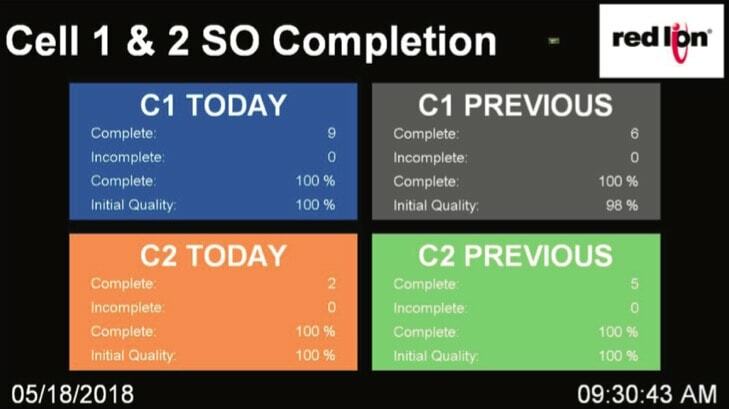 Similar to the previous point made for count (#1), management often uses target information to evaluate performance at each level. The visual management displays on the plant floor evoke competition and encourage employees to outperform their peers. While most types of KPI data pull directly from the machine, target data typically stems from office-based programs. Therefore, visual management systems that display target metrics need to connect to both plant floor equipment and back-end office programs. Production processes measure the production of scrap in terms of reject ratio. In addition to reducing waste, minimizing scrap helps organizations meet profitability goals, which makes reject ratio a high-priority metric. Visual management tools alert production teams to points along the production line where the amount of scrap produced is outside tolerable limits. This visibility gives teams the opportunity to make adjustments to improve the quality of the product and limit scrap. Machines and processes produce goods at variable rates. When speeds differ, slow rates typically result in reduced profits, while faster speeds impact quality control. To ensure steady profits and high quality, it is vital that operating speeds remain consistent. By visually pinpointing when and where a process speeds up or slows down, employees can immediately take corrective measures to level out the rates. Takt time (from the German Taktzeit, meaning clock interval) is the amount of time, or cycle time, for the completion of a task. This period could be the time it takes to produce a product, but it more likely represents the cycle time of a specific process. By displaying this KPI, operators see alerts when the targeted takt time is slower than usual. Understanding this metric in real-time provides an opportunity to quickly determine where the constraints are within a process and begin resolving the issue. Overall Equipment Effectiveness (OEE) is a metric that multiplies resource availability by performance and quality to determine resource utilization. Increased OEE values indicate more efficient use of available personnel and machinery. The higher the number, the more efficient the operation. World-class manufacturing companies typically run in the 60th percentile for OEE. Downtime is widely considered one of the most critical KPI metrics to track. When machines are not operating, money is being lost rapidly, which affects every other aspect of the business. Reducing downtime is a clear way to reduce losses and increase profitability. Alerting plant floor staff to downtime via visual displays helps engage the appropriate staff and resources to get the machine back up and running as quickly as possible. Over time, the industry has learned that downtime actually increases in the short-term when an organization begins using Andon messaging as employees adjust to the new process. At that point, the urge to revert to previous processes is strong. But when the organization stays the course, overall downtime decreases in the long term. By giving employees time to fully adapt to the new visual management process, companies realize the gains that were originally expected. Organizations that track downtime typically require operators to enter a reason code via keypad, pushbutton or bar code scanner to clearly identify issues. This tracking allows causes of downtime to be reviewed later. Tracking downtime and analyzing the causes also has the potential to inform predictive maintenance. For example, when data uncovers that a certain machine regularly goes down after it produces approximately 1,000 parts, the manufacturer has a unique opportunity to take proactive measures. A new alert can be programmed into the visual management tool that signals the team when the machine reaches 900 parts produced. That alert can initiate an automatic message to the warehouse to assemble replacement components. Another automatic signal can be directed to the maintenance department, where a repair crew readies themselves. With everything in place, the machine can be put into planned downtime just before it reaches 1,000 parts. The maintenance crew can also then make quick work of the repairs required. In this scenario, gathering the required resources ahead of time can cut downtime significantly. Included in the category of downtime, is changeover time. When a line or machine converts from running one product to another, the changeover time measures the cycle from the last good part of the previous process to the first good part of the new process. Like other types of downtime, a reduction in changeover time equates to increased profits. Clocking the cycle time on a visual management display helps operators stay on pace with target changeover times. By setting and tracking these types of KPIs, manufacturers have the data needed to make informed decisions at all levels of an organization. Human resources can make better hiring decisions when they understand what teams are understaffed and overstaffed. When selecting a visual management tool to illustrate KPIs in a production setting, keep the following considerations in mind. Depending on the KPIs measured, visual management tools can display anything from a simple count of items produced to more graphic dashboards that analyze multiple metrics simultaneously. They can display basic Andon System messages and customized messages. Advanced programming can even initiate a chain of events that automatically resolves the issue. The overall system capabilities and user interface should optimize processes and make work easier for employees. Visual management systems should include both the data collection technology and the ability to visually report the output. Some products capture data from equipment but can′t bring it to life on a display monitor. Other products simply display data on screens, leaving the manufacturer to find another way to capture the data. Visual management programs with end-to-end capabilities are ideal-they connect to the plant floor, analyze equipment performance, process the data and display the required information. Systems for displaying KPIs range from basic stack lights that display machine status to complete PC-based production monitoring. Select a vendor with the ability to tailor a program to your organization′s budget. Then, carefully consider the financial value of improved performance and choose an option that will quickly pay for itself as inefficiencies are discovered and resolved. The latest trend in production displays stems from the falling cost of consumer-grade televisions. 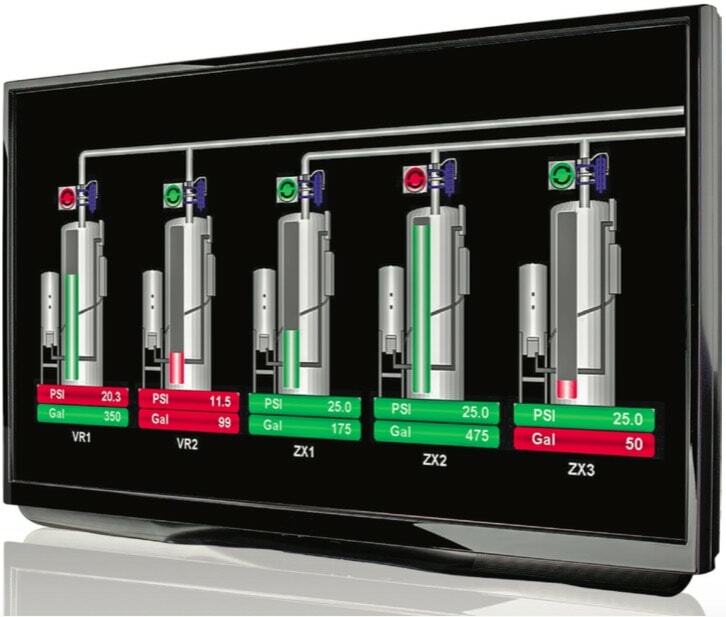 With the ability to display images in high-definition, at-screen LCD televisions are the industry standard for displaying KPI information on the plant floor. Selecting a partner that enables connection to a TV screen helps keep costs low and achieve return on investment more quickly. Visual management tools must also be flexible enough to connect to any piece of machinery or equipment, regardless of its age or vendor. It′s unrealistic and cost prohibitive to consider replacing all legacy equipment or aligning all equipment under a single vendor. Age- and vendor-agnostic systems allow manufacturers to leverage existing equipment. This consideration is key to keeping investment costs manageable. Similar to equipment connectivity, a good visual management program should easily sync with existing networks and servers. This synchronization enables the displaying of target KPIs generated in office-based programs, such as SQL servers. Synchronization also allows the manufacturer to pull all the collected metrics into common data analysis tools. By analyzing and reviewing trends over time, an organization can make data-driven decisions. A good visual management partner makes intuitive and user-friendly tools. The tool should be internet-ready and easy to connect to a display device, such as a TV screen. Programming the metrics to capture with the tool should be as simple as "point-and-click" or "drag-and-drop." Consider plant floor employees′ ability to learn new tools quickly and use them easily. Look for systems that offer built-in communication drivers and protocol conversions for seamless connectivity to all equipment and network devices. Visualize metrics that are unique to an organization. Initiate actions that correct deviations in production. Change the measurements and visualizations as company needs evolve. Choose a system that is scalable and customizable to the evolving needs of your business. Its capabilities and user interface should optimize processes and make work easier for employees, both during installation and throughout use. Technical report by Red Lion Controls.